Exploring around my house in Etna, NH (near Hanover), I found the remains of a rope tow: the top truck with pulleys and other pulleys going down the hill. I called the landowner and found out some details. Her family built it in the late 40's and they and their neighbors skied in this former pasture before there were real resorts. It has been abandoned for about 40 years, but there may be skiers from the area who skied there. The top of the tow. The "Archeologists" shows Myself, my son Lincoln, and Emmett who was used for olfactory clues. This picture shows the engine that ran the tow. Underneath the gas tank, there is a crossbar with two wheels that direct the rope to the top of the wheel on the right and the bottom of the wheel on the left. Notice the metal slats welded onto the wheels to provide more traction on the rope. 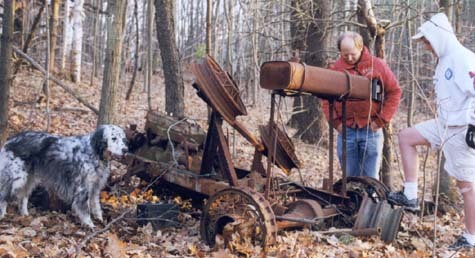 It is a four cylinder engine and the entire machine was anchored to trees with two cables. The vehicle used for the tow was obtained by Elaine's husband's cousin from Durham, NH. 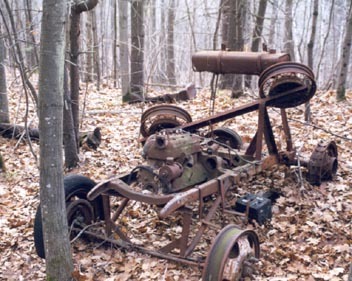 It looks like it was an old truck that had been shortened for use as a farm or woods tractor, a modification often known as a "doodle-bug". 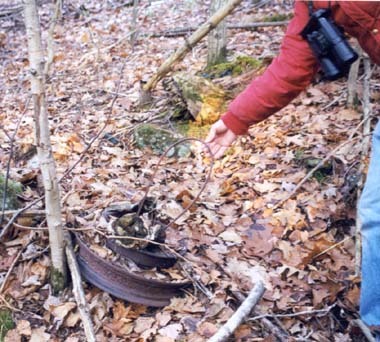 This picture shows one of four pulleys we found. Several of these still turned. 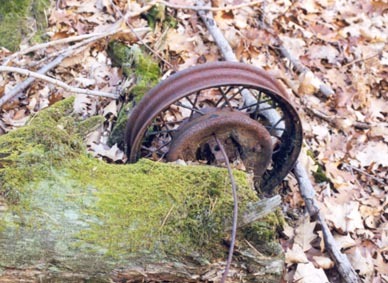 The metal loop was used to attach the wheel to a tree. This picture shows another wheel still attached to a Pine that had been cut down quite a few years ago. The number of branches on this trunk indicates that this tree grew in an open pasture, without the shade on other trees. Does anybody else remember this ski area?